Yuichiro Murakami’s wrinkly leather slippers hug your feet like snug old socks, or an extra layer of skin, and you don’t want to take them off, so it’s a good thing you bought them, isn’t it, these good-feeling things, good-smelling, intelligently thought-out and practical, like the other stuff he makes. The shop in Kuramae is called M+, pronounced M-piu, the + as in the Italian for plus, and the M for Murakami. It’s a self-confident sort of name, though in other matters he can be almost too modest – he can be shy to say he learned leathercraft in Italy, where he was one of only two annual scholarship students from Asia. He studied not just design and pattern-making, but also took a course on operating the sewing equipment. He says normally in Italy the tasks are separated between the sexes, with women working the machinery, but Murakami wanted to absorb everything, and afterward he got a job making patterns for one of the Benetton companies. The Italian influence lingers. He makes espresso in his upstairs workspace when friends and associates stop by. He always makes you laugh. Maybe it’s because he likes conversation and word-play and has a sort of mischievious, easygoing air. He likes fishing. You figure his personality would have gone down all right in Firenze. Before Italy he worked at an architectural firm – that’s his original field – but he decided it didn’t allow the freedom he wanted. He says, Houses are hard. If you’re making a house for a client you can’t design parts of it just to try something out. He says, Houses are hard. If you’re making a house for a client you can’t design parts of it just to try something out. He’s also not much interested in making things to order. He doesn’t like the way bespoke design is priced. He says, It’s not clear to me why one thing should cost, say, 10,000 yen, and another thing, 30,000 yen, when the only difference might be that one is a bit bigger, or it’s got a pocket. 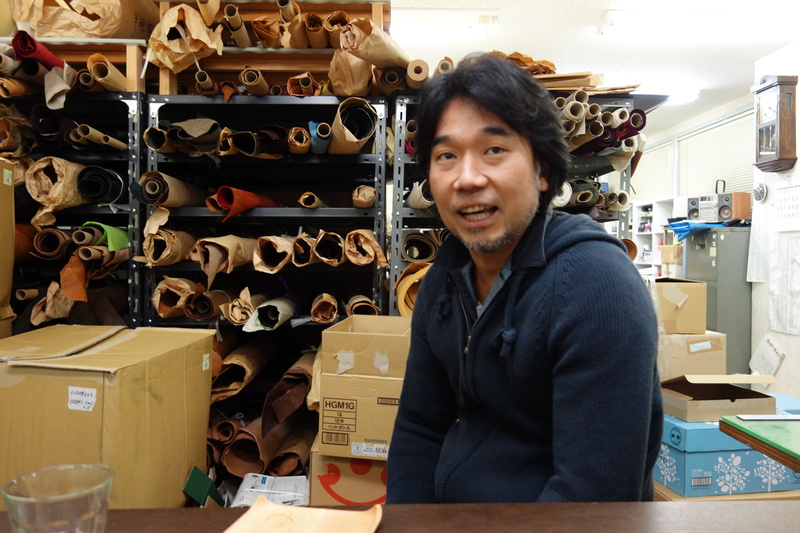 Murakami’s method is to design and make a sample to be reproduced by craftspeople. Something original that fills a need and looks good, is high quality and works well. The price will be reasonable; it’s part of the concept. His signature product is a book-like wallet called the Millefoglie, that carries notes, coins and cards. You bought one because you could instantly see that it makes sense, the way it opens and holds things, and the leather is nice. It was hard to choose a colour. Samples of worn wallets in the store show how well they age. The wallet emerged during Murakami’s residence at Taito Designers Village, some 10 years ago. It was written up in the Asahi Shimbun by a famous consumer goods columnnist. The story ran in the weekend paper beside a recipe for chijimi Korean pancakes. Murakami says, When I came in to the studio on the following Monday the fax machine had been completely swamped, and the phone rang off the hook all day, and the odd thing was all the customers were women, from Okinawa to Hokkaido, even though it’s a man’s wallet. The response ended up so big that the wallet virtually carried the company for the next 10 years. All I need now, says Murakami, is another wallet for the next 10. A challenge is finding people to make his things. The ranks of craftsmen are dwindling and there are few young replacements. In the rush ahead of last Christmas, one supplier failed to deliver. So before New Year, Murakami started to rearrange sewing machines upstairs, so he can go back to making stock himself, or bring in another craftsman. I’ll be a bit rusty but I’ll manage, he says. 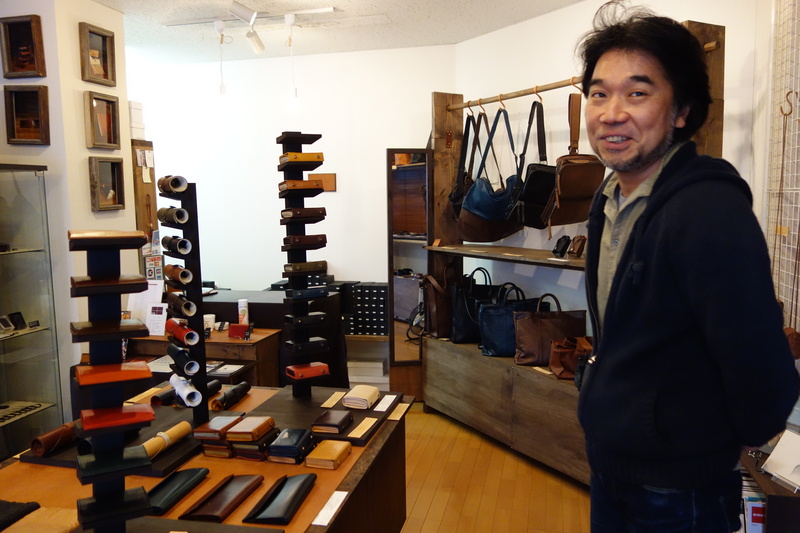 He is also blessed with dedicated staff like Risako Tsutsumi (pictured in red) who is a skilled leather crafter, and Shoko Kato, a Japanese literature graduate who came to M+ after following Murakami’s blog. Sadly, the espresso bar will have to go. With the shop just passing seven years in its present spot beside a century-old tofu-ya, Murakami is one of the longest established of the new wave of Kuramae creators. Talk to the craftspeople around here and you pick up on their respect for him. But he’ll dismiss the suggestion he is high in any hierarchy. He says, I’m just older. I have stayed in Kuramae a few times now and have not seen M+. it is this type of story that highlights for me the many interesting people and places worth seeking out. Another gem in a series of great bits. Thanks for keeping it up.